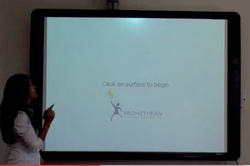 Below are a few items of reference when encountering issues with your Promethean. a) Ensure the correct source is selected on the remote (e.g. Computer, Video, HDMI etc.). c) Check image settings on the Projector via remote. d) If odd colouring continues attempt replacing the adapter connecting the VGA to the Mac. a) Ensure USB connections are in place. 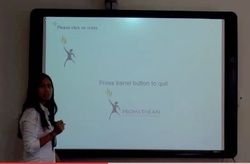 b) If issue persists, try different USB port, restart computer and Promethean board. c) If issue persists, check Pen Settings in ActivManager. d) If issue persists, check Driver version, update if necessary. e) If issue persists, attempt calibrating the pen or try a different pen. – Calibrating the board aligns the pen with the on-screen cursor/mouse. – There are three methods for beginning the calibration process. 1) Hover pen over white flame in the upper left corner of the board until the flame turns blue. 3) From dashboard, select ‘Configure’ then select ‘Calibrate’ from the menu. click surface with pen to begin. cross-hairs that appears on the screen. b) Ensure board audio is on (standby switch at side of board, along with volume controls). c)If patched into Soundfield system, ensure Soundfield receiver is on. b) On the Mac, go to System Preferences>Audio. Ensure the volume is up and that the correct device is selected for output. a)Check and or replace the remote batteries. b)Ensure the IR sensor at the front of the projector is unobstructed and or free of dust. c)Reset the remote frequency. Pointing towards the projector, press menu and image together and hold for 30 seconds. This will reset the remote’s IR frequency. 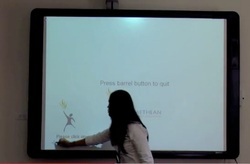 Attempt to control the projector.